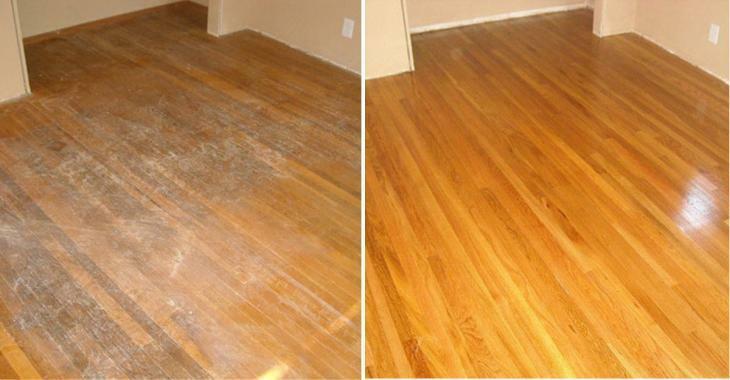 Tips that will help you keep your wood floors in good condition longer. Hardwood floors are a great way to add value to your home. Several types of wood exist. They are various colors and grades. So different qualities, some are very affordable and some are very expensive. But no matter what wood floor you choose for your home, wood is always a very good choice. And the maintenance of the wood will remain the same. Except that the maintenance of some wood floors may require a little more attention than some other types of floors. But they are worth it. Because once installed, your wood floors will be part of your decor forever. Canola oil can help you remove scratches on your wood floors. Mix 1 part white vinegar with 2 parts Canola oil and use a soft, clean cloth to remove any scratches in the wood. No need to wipe. The solution will also make your floor shine. Use ice cubes to remove chewing gum glued to a hardwood floor without damaging it. Place the ice cube on the chewing gum for at least 1 minute. The time that the chewing gum hardens. Then use a kitchen spatula or razor blade to gently and easily scrape the gum off the floor. This works well with glue and adhesive residue also. Do not try any other technique that could damage the floor. Prevent floors from cracking with baby powder. Sprinkle a generous amount of baby powder over your creaky floorboards. Work the powder into the cracks using a paintbrush until the floor no longer makes any noise. Use walnuts to remove marks and scratches on wood floors. Just rub the shelled walnut on the scratch until the scratch disappears. Do not panic if you have permanent marker on your wood floor, toothpaste can remove permanent marker. Use a little white toothpaste and a microfiber cloth to rub away the mark, your floor will be like new. Pet urine can soak into wood floors creating a stain and a lasting unpleasant odor. Wipe up the mess as best as possible then sprinkle a generous amount of baking soda. Leave the baking soda on the stain overnight then wash away with a gentle cleanser. Did you notice a small dent in your floor? Like a hole made by the tip of an umbrella or other sharp object? An iron will solve the problem. Moisten the dent with a damp cloth. Then place the damp cloth over the dent. Next, place the hot iron on the damp cloth and make circular motions to heat the damp cloth over the dent. The heat of the iron should swell the wood and the dent should disappear. If it does not work the first time, moisten the dent and then try again. This product is really magic. Use it to remove all scratches on the floor, without damaging it! Black marks of shoes etc. Avoid scratches and scuffs by using microfiber cloths. The soft texture will keep your floors smooth much longer. Avoid straw brooms and devices that can damage your floors. Your floors will stay smooth and scratch-free. Try this once in your life! Wash your hardwood floor with black tea! Take four tea bags and boil them in 550 ml of water and let the tea brew for as long as possible. Then use black tea to moisten a clean cloth and use it to clean your floor with a pleasant scent of black tea.